Inside the (outer) oval configuration of arches another one is placed, parallel but not as high. Inside that a third, lower yet, and so on, and then a final lowest oval is set to surround the field of action. The Colosseum, or the Coliseum, originally the Flavian Amphitheatre (Latin: Amphitheatrum Flavium, Italian Anfiteatro Flavio or Colosseo), is an elliptical amphitheatre in the centre of the city of Rome, Italy, the largest ever built in the Roman Empire. How exactly the Romans laid out the parallel sequence of ovals for the Colosseum has been a matter of scholarly debate. However, it is likely that they were laid out , one by one, as a combination of circular arcs. I consider the manner of construction suggested here on a separate page. 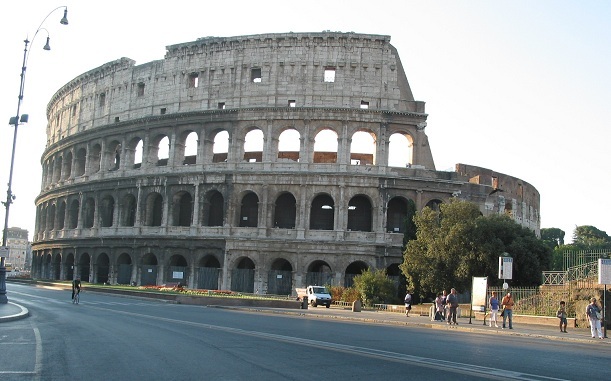 For now, the applet below presents an aerial view of the Colosseum I obtained through google maps. Point (x, y) lies on the conic if its coordinate satisfy the equation: Ax² + Bxy + Cy² + Dx + Ey + F = 0. This can be considered as a linear equation in six coefficients: A, B, C, D, E, F. However, since the equations are homogeneous (the right hand side is always 0) only five coefficients are independent, so that only five points are needed to determine a conic uniquely. In the applet, with the "Points & conic" box checked, you can place the five points at the locations of your choice and see the conic that passes through all five. Check how close it may made to fit the outlines of the Colosseum's ovals.